Hi, this layout is verified. Does anyone know the Res. Potentiometer value? 100k log maybe? In the original schematic the reso pot is 10k. However i once build this and made a dual Version, both switchable between LPF and HPF and able to work as two separate VCF's and wasn't really happy with my results. A few weeks ago i decided to stick rather to the original schematics and replace all different values and add the few missing components except keeping the Op-Amp buffer and well i think ti does sound much better now. Perhaps add a input attentuator for the signal in and a trim each for resonance and center frequency. btw. 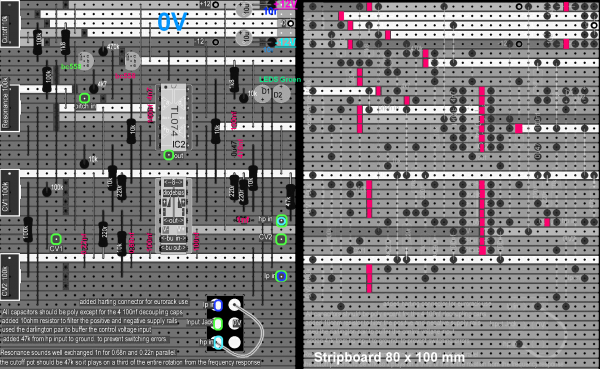 the above posted stripboard layout can be improved. First add some 10R resistors and decoupling caps on the power rails, also use decoupling caps for the LM13700 and place them as close to it's rails as possible. perhaps move that one resistor leg away from the bottom of the IC or move it more to the side and cut the trace behind it and then make this line a gnd line so you can place the caps really close, going from 6 and 11 to the trace below the IC. Also i see there is a flaw in this layout, on the OP-amp pin 1and 2 (the Op amp in the resonance Feedback path) the diodes (original 6 diodes, 3 in each directing in series or instead 2 LEDs) and the feedback resistor (original schematic 10k) seem to be off, they should sit between 1 and 2 and not connected to -12V. Perhaps you should have a look at the original schematic too, and also there's somewhere in the net the Adaption of Scott Stites with the switched variant, were you can change between LPF/HPF mode. Thanks for the upgrades. I'll give em a try when I get there. Is Res 2 suppose to be there? Don't see it. I found the later layout without that Switch. Also, I went digging and found the schematic, or I think I found it. i'm not sure what you mean with the bottom resistor. what i meant, was moving R18 (10k) the resistor for the Signal Input to the left on the board, then cut the trace right to it (on the leg at the bottom and not that one going to the LM13700), hook te inputwhich is here labelled as SW B1 to the hard left on that race and then you would have the rest of the trace "free" and could use it as a ground line to connect the decoupling caps to the IC, which are included in that design already even if in a bit more distance, but what i ignored in first instance or simply haven't seen first. 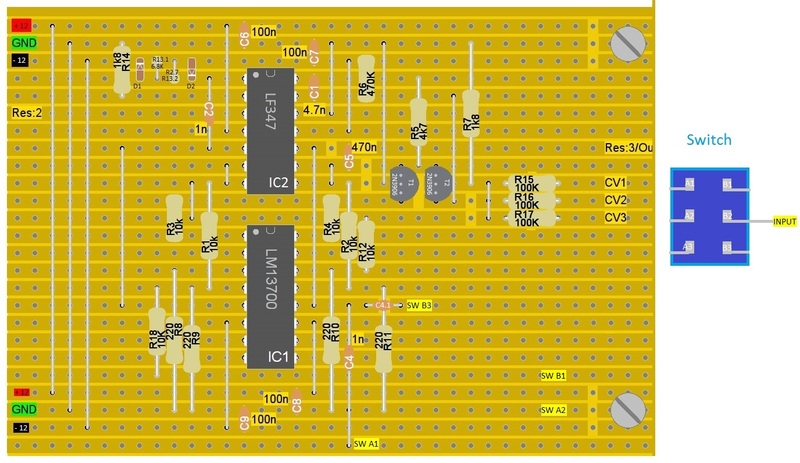 That's the only layout i made, it took as nearly as Long as doing the stripboard so i decided to move along my usual way and just solder my way through the schematics. Further thought on reducing the signal path for the Input is, if you Keep your signal lines that Long and especially direct between the rails, this could result in crosstalk of your signal to your power rails... so it's best to Keep them as short as possible. Well the third leg of the resonance pot goes straight to gnd... not drawn there but can bee seen in the schematic you've posted. 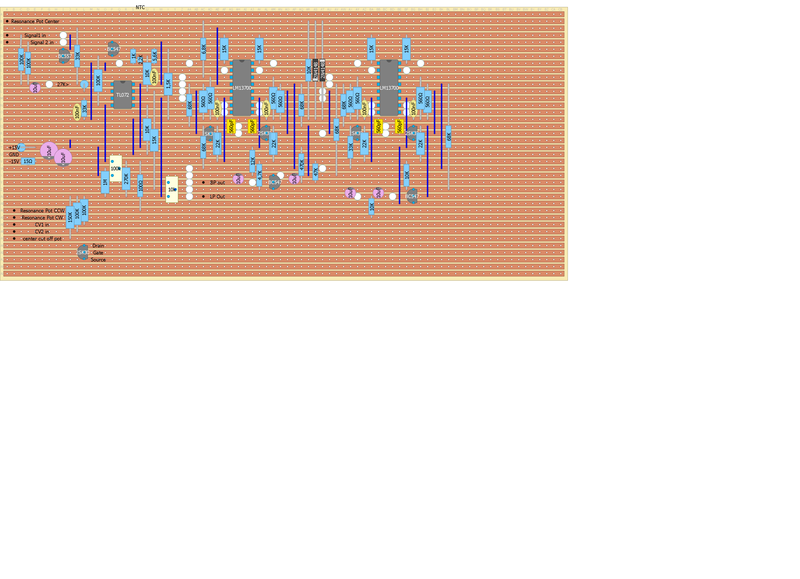 What i said Looks false is what is in the schematic A3 which is in the layout the upper left OPamp of the LF347. You see the spacing is incorrect for the diodes, moved on trace up. I strongly recommend to try and use his Mutant vactrol VCF you can build These also as separate VCF's and only having the BPF Version so far, this one kicks asses. Note, that in the MS20 the Signal goes first into the HPF and then into the LPF, both are almost the same except a few minor changes, they mostly differ at the Point were you insert the Audio signal. You can build also a single VCF of it were you can Switch the unit between HPF and LPF, what i have done.... build 2 of them so i can resemble the original signal flow or let them act as 2 separate VCF's. Still waiting for my LF347 to come in the mail to test this beaty out. 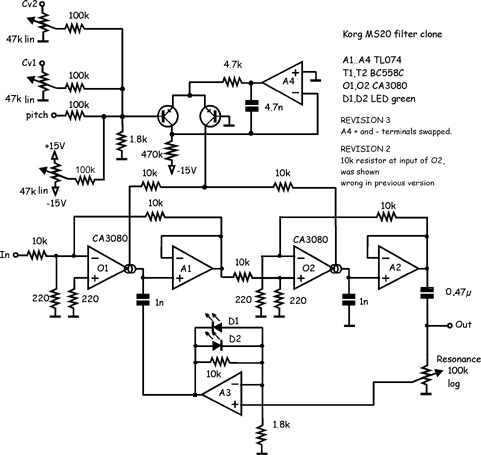 Looking at the schematic I was confuse at first, but Reso 1 goes to GROUND. But I'm confused to where A3 goes on the switch wiring. Ground??? I experimented a bit today. came out at the end so that I take the two darlington buffer to buffers cv 1 and 2. I also exchanged the 1nf for 0.68nf and 0.22nf in series and took the lf347 instead of the tl074. sounds very good and the resonance is not so fat anymore.